The historic Saint-Michel Catholic church built in 1783-1789, presbytery and cemetery in the heart of Old Vaudreuil, Vaudreuil-Dorion. In villages or large cities, on the shores of great rivers or in the countryside, church steeples mark the Quebec landscape. They are geographical landmarks as well as cultural symbols. 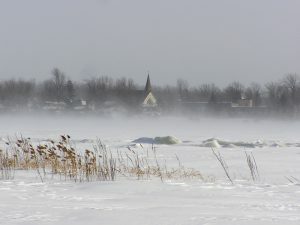 The rich and diverse religious heritage of the Vaudreuil-Soulanges territory bears witness to the unique stories and memories of its local communities. As religious practice fades, churches still stand and remain powerful testimonies of Quebec’s foundational cultural identity. Far more than a place of worship, churches are intimately woven into Quebec’s social and artistic history. Today, the future of churches and objects they contain is uncertain. Join us on this journey as we share their stories so that their memory may live on. This exhibit was produced by the Société d’histoire et de généalogie de l’île Perrot in collaboration with the Musée régional de Vaudreuil-Soulanges.